Talking about math might not be so exciting for a fifth grader, but discussing baseball stats, that's something else! Our fifth graders have participated in an interdisciplinary Math/Sports Week related to how statistics are used in baseball. The boys learned how to calculate some statistics such as ERA and AVG, gained experience using a scorecard during their sports periods, and received an introduction on how to use an application called Game Changer to collect and analyze data. 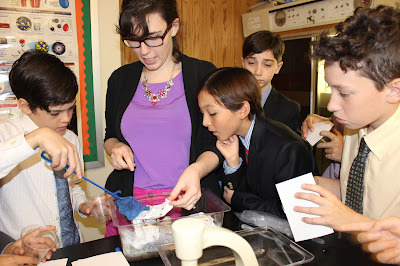 The unit is team taught, led by math teacher Bridget Gallagher and coach Craig Learn. In their initial sessions, boys completed a visual about statistics and were introduced to three main baseball stats (AVG, OBS, and ERA). They then used data from last year's 7th and 8th grade baseball team to calculate these stats. By the end of the week, they assumed the role of baseball team manager of either the Yankees or Oakland A's looking at and analyzing player stats, and using their analysis to determine who should be in the starting lineup. This is a great example of active, interdisciplinary learning that makes math engaging to our boys by demonstrating its practical application. The spirits of Chuck Close, Andy Warhol, Andrew Wyeth, William Wegman and Jeanne Claud and Christo, among others, were present in the Hume Library this Monday for the annual ARCO exhibit competition. 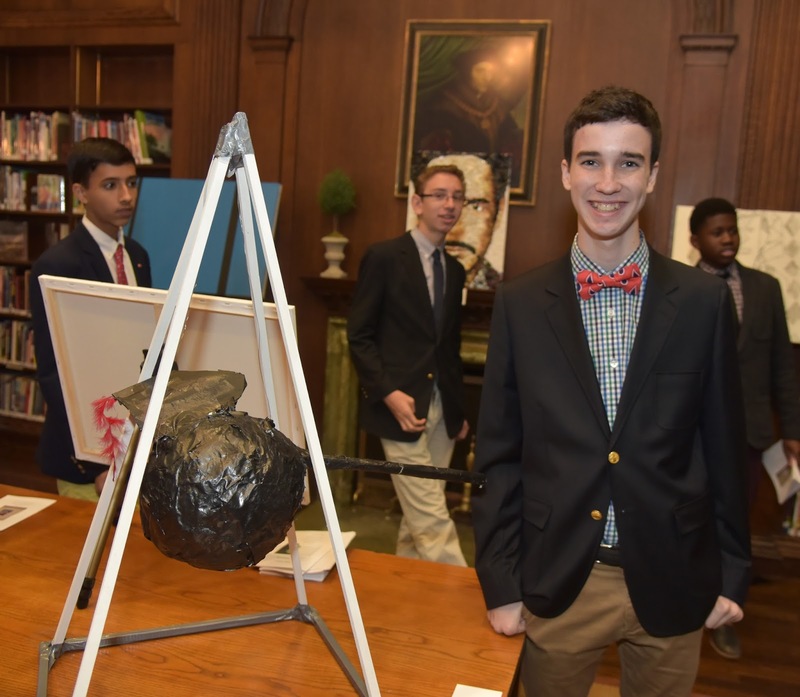 ARCO is the final project of the Eighth Grade Humanities Class, in which each boy is challenged to create a piece of work in the style of a famous modern artist, but with his own interpretation and analysis so that the pieces are homages, not imitations. The boys also write a biography of their selected artist and reflect on the process they used to create the work, including what they found most challenging. 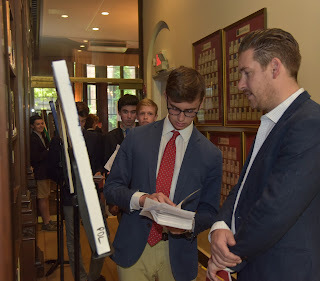 They presented their artwork and rationale to judges during the day on Monday, and in the evening their families attended a reception, the Salon de diplomes, in which the boys commented on their work. This is such a grand finale in an interdisciplinary course that has become one of the cornerstones of Saint David's program of studies. The humanities class deepens our boys' history and art history knowledge and understanding, while honing their research and public speaking skills. I am always so impressed by the boys' maturation in these areas, as reflected by their ARCO projects. 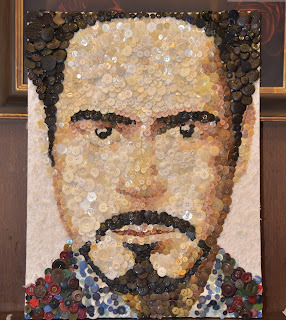 Often, as I listen to a boy speak so expertly of his artwork--the approach he took, the problems he encountered along the way, the lessons he learned--I no longer see him as an eighth grade student, but rather, as a soon-to-be graduate. 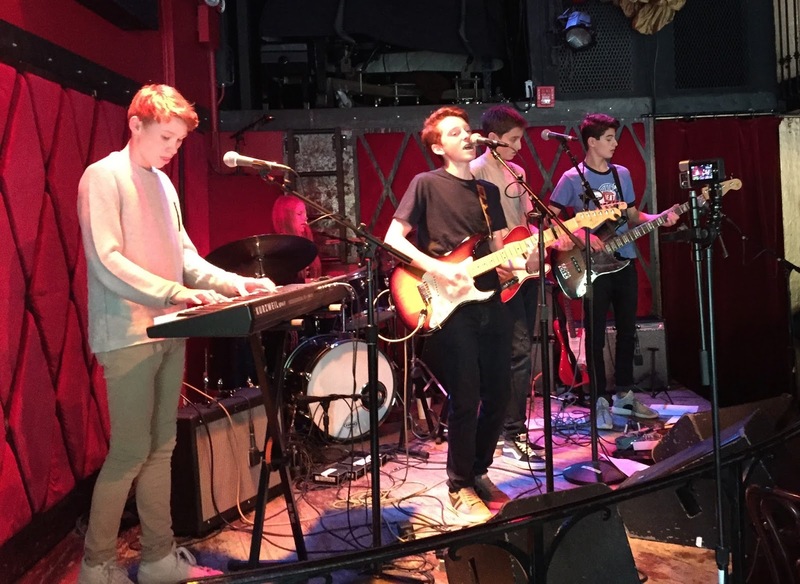 As reported by our Music Chair Jeff Moore, "It was a spectacular show by these two very talented bands, and sadly, a farewell performance as the boys will all be attending new schools next year." This morning's spring concert was a celebration of the comprehensive music program at Saint David's. The Philharmonic Ensemble, Percussion Ensemble, and Chamber Singers all provided heartfelt, accomplished performances of diverse musical selections under the direction of Phil Hough, John Francis, and Phyllis Clark, and the overall leadership of Department Chair Jeff Moore. Congratulations to all of the boys who performed this morning. It was an unparalleled display of talent and determination. 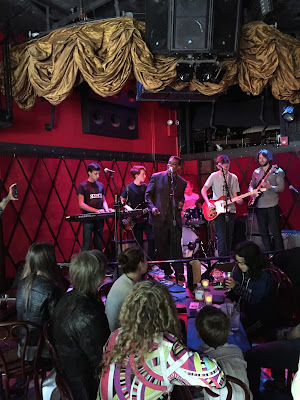 The boys helped everyone in the audience start the day with a smile. 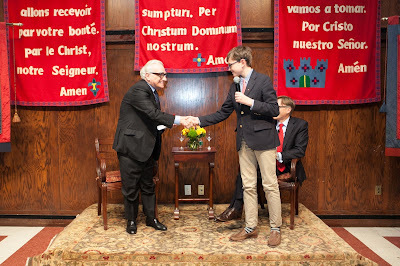 The clip below features highlights of the concert, and concludes with the Chamber Singers' rendition of "All Good Men," a song composed especially for Saint David's by parent Tom Kitt. 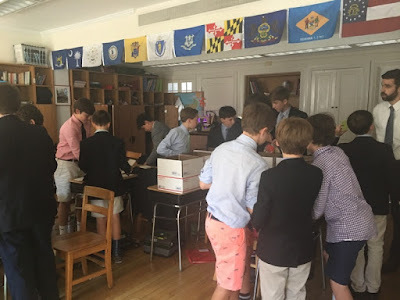 In preparation for their Confirmation ceremony, our sixth graders made care packages to send to soldiers overseas in Afghanistan and Iraq. Each boy wrote letters expressing their gratitude to our armed forces. They also participated in a Facetime call with a recent veteran, Captain Jonathan Anderson, who talked about his two tours of service and his experiences as a field artillery officer. 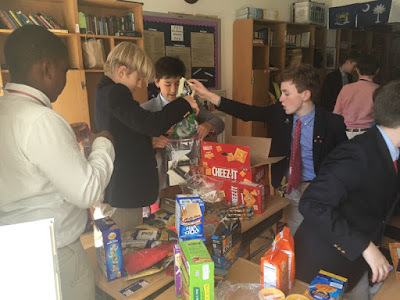 They learned about the best items to send to soldiers and prepared a list, which included card games, spices/hot sauce, powder to enhance water, oatmeal and ramen noodles. They then went home and collected supplies. In total the boys made 22 care packages, which are being sent this week to bases around the world, expressing our thanks for protecting our country. They were on the "Top of the Rock" but may as well have been at the top of the world. All of New York--an amalgam of steel, glass, river, sky, and concrete-- stretched out ahead of their gazes. 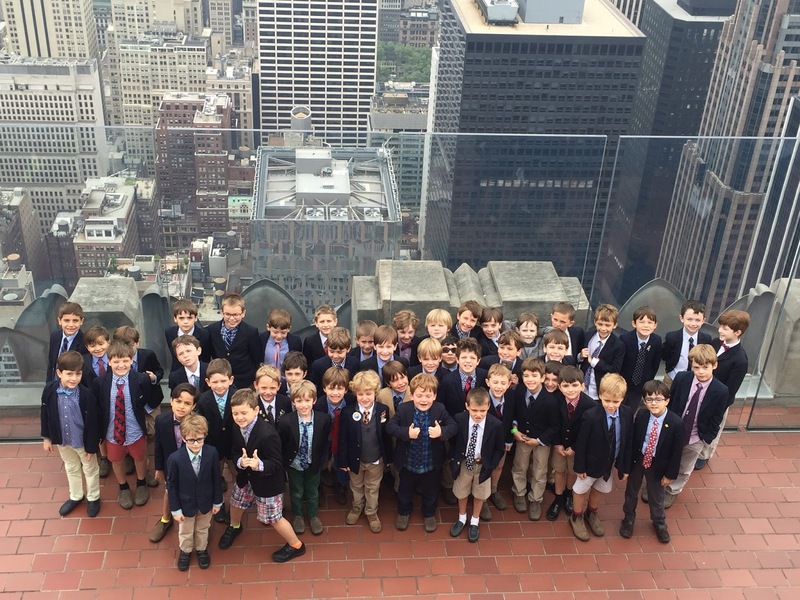 The clouds may have tried to obscure Lady Liberty, but the boys knew she was there, and where. This year, first graders have been learning all about mapping and the geography and landmarks of their city. Today's field trip was an opportunity for them to apply their understanding. They had a terrific time! 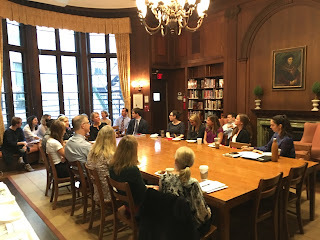 On the morning of May 11, 22 faculty members met in the Hume Library to enjoy breakfast and reflect upon their individual and collective achievements as participants of Saint David’s Mentoring Program. Designed to support new faculty in acclimating to the school, the program ensures two years of professional development focusing on classroom management, curriculum design, assessment, and best practice for teaching boys. Mentors meet with mentees on a weekly basis, conduct observations, provide feedback, and answer questions as they arise. Most importantly, mentors help new faculty experience a sense of belonging within the school community. Highlighting each other’s instructional expertise and contributions to the school community, teachers shared anecdotes and accolades during the breakfast gathering. Mentees expressed gratitude for the ongoing support and guidance provided by the school while mentors acknowledged the enthusiasm, commitment, and ingenuity shown by Saint David’s newest teachers. How Big Are Our Feet? To answer this question, first graders recently completed a fun and challenging math investigation on measurement. First, they estimated what size they thought their foot would be. 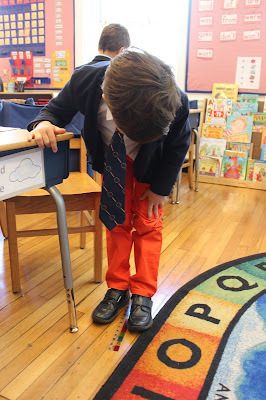 Then, they measured their own, and collected data on the size of their classmates' feet. Using standard as well as non standard units of measurement, they learned about the various ways data can be depicted and were charged with making posters that charted their findings. They also had to make observations, based on the data in their charts. Boys worked independently or collaboratively to present their findings. Students then had the opportunity to share theirs with their classmates. The investigation concluded with a first grade “foot museum," where participants displayed their results and viewed other class findings. This is active, hands-on learning that makes math real and helps boys to comprehend mathematical concepts and build analytical skills. Aquarium plus terrarium plus goldfish, snails and crickets equals ecosystem. Fifth graders are learning how ecosystems operate by creating their own. Today they added goldfish and snails to the aquariums they built earlier. Then came the live crickets! Boys carefully captured the active creatures using a small fishing net and then added them into their terrariums where they could feast on the plant life that the boys had introduced. 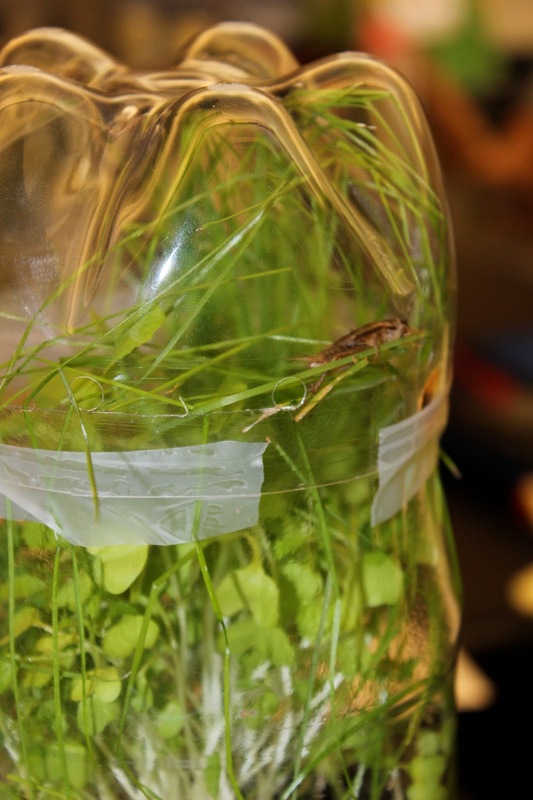 In the end, the terrariums are joined with the aquariums to form functioning ecosystems. 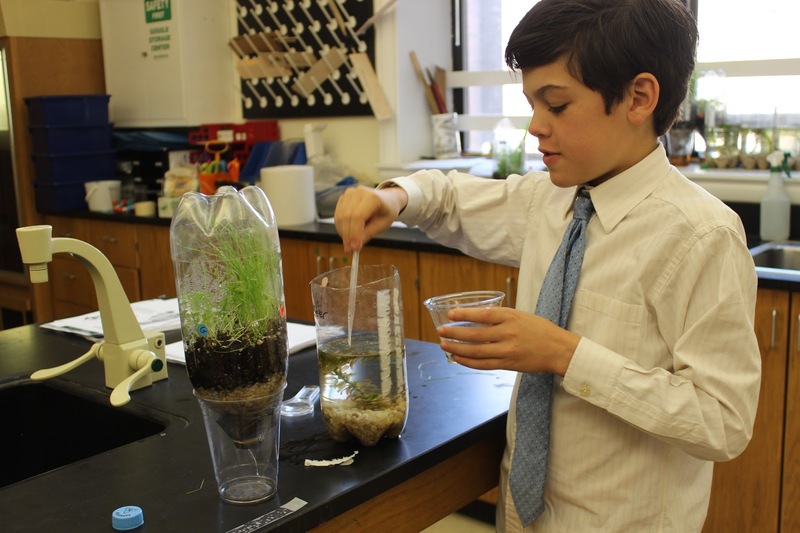 I can think of no better way for our boys to learn about the interdependence among living and non living organisms and their interactions with their environment than by building their own such communities. Twenty young paleontologists taught their parents all about dinosaurs during Friday's Omega Dinosaur Presentation. The show included songs like "Dinosaurs Lived Long Ago" with special verses written by the boys, as well as recitation of the boys' favorite dinosaur facts. These boys know a lot about the prehistoric animals; they have been learning about them this spring in an interdisciplinary unit that integrates art, music, science, and social studies. 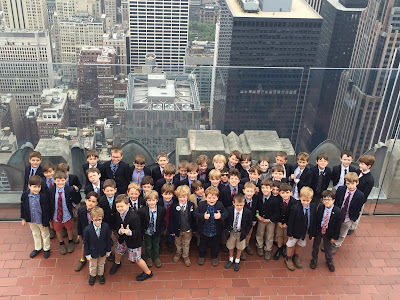 During their study, they visited the dinosaur exhibit at the American Museum of Natural History, worked in groups, and explored the concepts of time periods and archaeology. 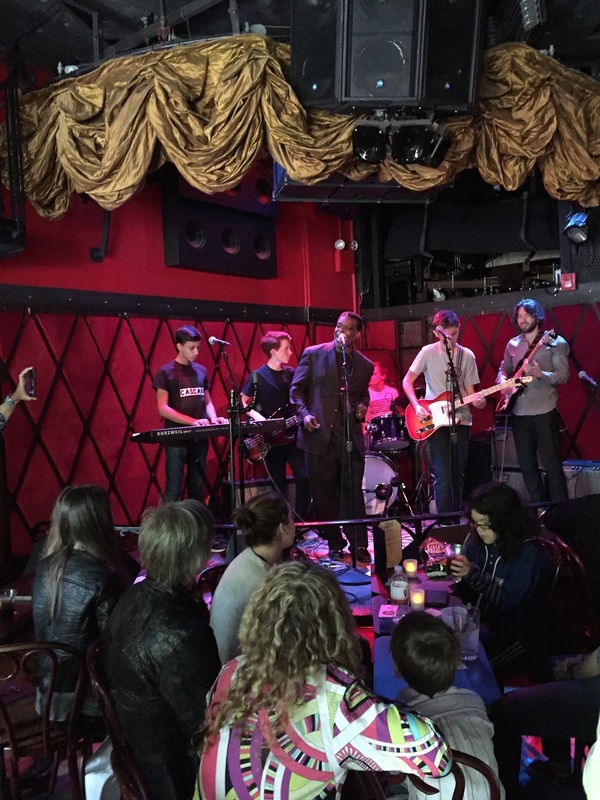 Congrats to Declan, Lucas, Wyatt, Richard, Hayden, Francis, Gates, Mack, John, Sanders, Aidan, Luis, Trevor, Charlie, Camden, Jasper, Camino, Hutch, Rohan and George for a great demonstration of their knowledge and expertise; and to teachers Ms. Cohen, Ms. Buss, and Music Director Mr. Moore. 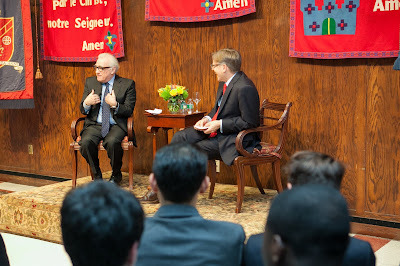 Martin Scorsese was the featured speaker at Wednesday evening's Alumni Parents Council Lecture at Saint David's School. 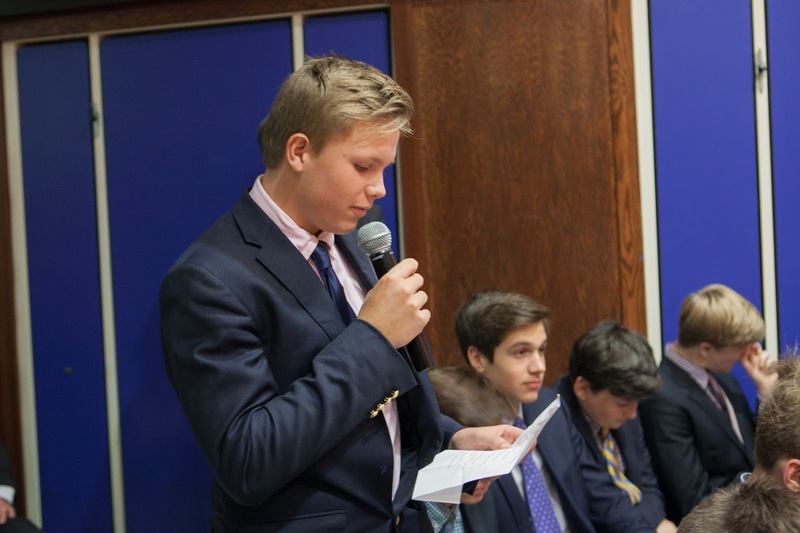 The iconic Academy award winning director, producer, screenwriter, and film historian provided a scintillating evening for our eighth grade boys and alumni/alumni parent community that touched on topics which were personal, professional, and philosophical. I had the opportunity to ask Mr. Scorsese several questions and his responses were generous, honest, and highly entertaining, delivered in the fast clip, animated style that is his trademark and the mark of a man brimming with ideas, who has done a lot, and has much more to do. He spoke about the impact of growing up on Elizabeth Street in a Lower East Side very different from today's, where he witnessed tough street life and moral dilemmas that would shape his films; of the influence of his father, who took him often to the cinema, where he fell in love with westerns as a boy; and of his fascination with the stories behind ordinary people and troubled peoples' lives. "My father would talk about different issues going on in the family and he would say 'but they could never make a movie about that.' And I thought, why not?" "What is a good man? Here you have people living in a world with underworld figures. How can you be good in a world that is bad? What happens to a good man or woman who goes bad? There is shame and heartbreak in that." I asked about any teacher that may have been a strong influence in his life, and he spoke of a young priest at the old St. Patrick's Cathedral, Father Príncipe, who inspired Scorsese to get an education so that he could get out of the neighborhood and make a different life for himself. 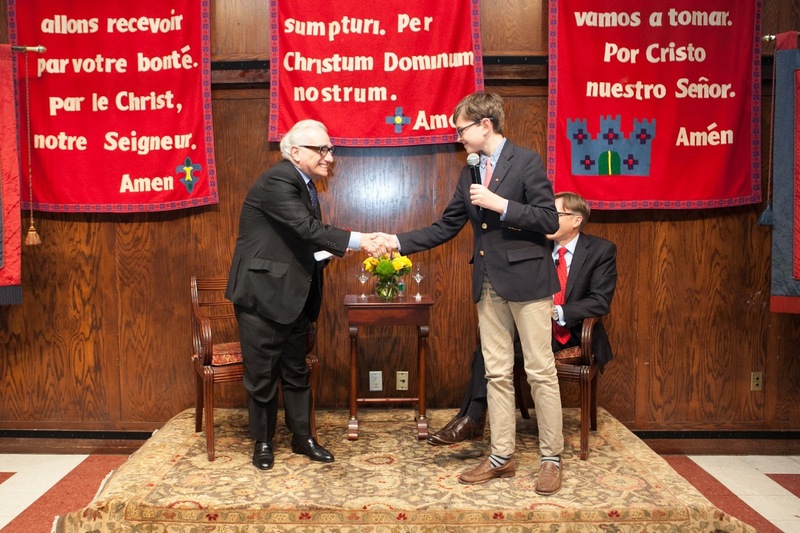 He spoke of how failure can be a good teacher, and encouraged our boys to "walk a fine line between passion and patience," in their lives, noting that the radical changes in technology have led to a demand for "fast gratification that doesn't give you anything of substance. To get something richer takes time." He also cautioned about "being tempted by the glittery aspect of success," the superficial rather than the important. The evening provided a fascinating exchange of thoughts with one of the greatest filmmakers in the history of cinema. 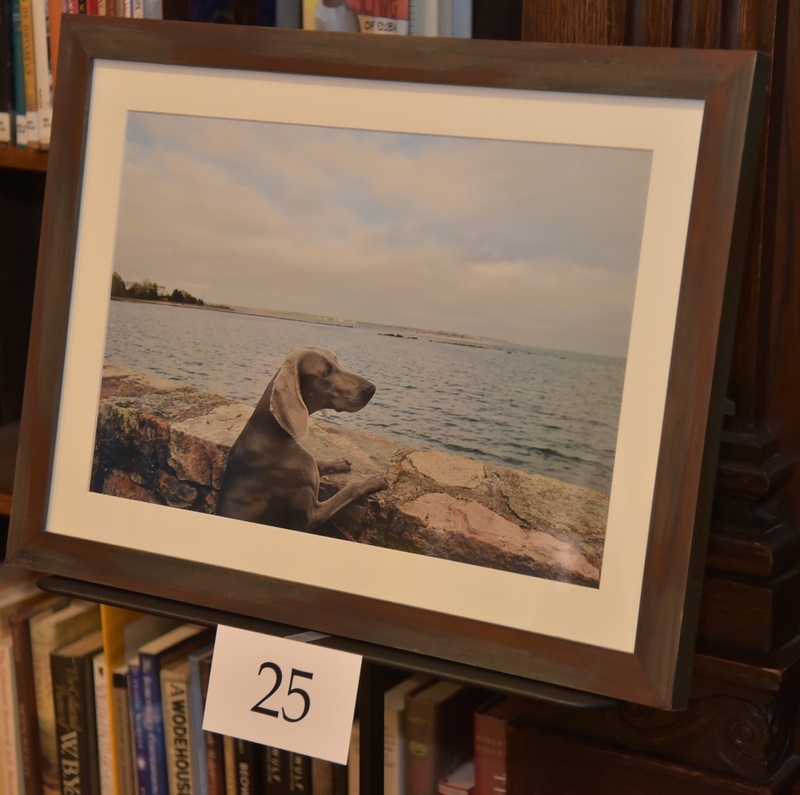 Gratitude to Jeffrey and Samira Sine, and Alumni Parents Council Chairs Dorothy Faux and Linda Foran for helping bring this event to fruition.